This case is about the genuine use of shape marks. 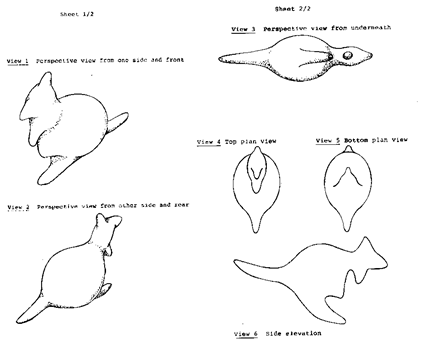 M J Quinlan & Associates PTY Ltd. of Australia own a 1999 registration for the shape of a kangaroo. The mark is protected for potato snacks and potato crisps. The plaintiff owns or owned a patent and design rights to the kangaroo-shaped crisps which were granted in the mid-90s. They gave a license to the intervenor of the proceedings, Intersnack Group GmbH & Co. KG, to produce and sell the kangaroo-shaped crisps in the European Union. 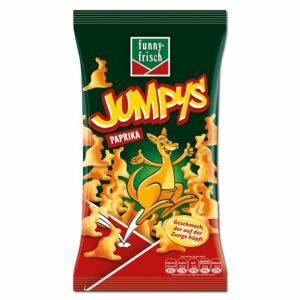 Intersnack gave the product the brand “Jumpys”. “Jumpys” joined Intersnack’s other salted snack products under their umbrella mark “Funny Frisch”. “Jumpys” has been a tremendous success. The crisps come in opaque packaging which shows pictures of the registered shape in side-on, like a herd of kangaroos jumping by. It further displays the marks “Jumpys” and “Funny Frisch” prominently. In 2014, Intersnack got tired of paying license fees, as licensees sometimes do. With the terms of the patent and the design right nearing their end, the only obstacle to selling kangaroo crisps without having to ask anyone was the potentially eternal shape mark protection. So Intersnack applied for the cancellation of the shape mark for non-use. This strategy seemed counter-intuitive, considering the fact that hundreds of millions of crisps, shaped according to the registration, had leapt over the counter by the time the application for cancellation was filed. But in the complex world of shape marks, sales do not equal use. •	the public regularly did not regard the shape of products as an indication of origin compared to word or device marks which are separate from the product itself. The Court continues that, for the genuine use of a shape mark, the consumer has to see the shape at the time of purchase, either embodied in the product itself or in a picture on the packaging. As the consumers cannot see the crisps through the packaging, Quinlan relied on the depictions of the kangaroo shape on the packaging. The Court, however, did not accept these depictions as an instance of genuine use of the mark. The reason lies in the other marks “Jumpys” and “Funny Frisch” displayed on the packaging. The Court agrees with the Board of Appeal that the public sees the marks “Jumpys” and “Funny Frisch” as the indicator of origin. They make the depictions of the shape mark seem secondary and ancillary, according to the findings of the Board of Appeal. 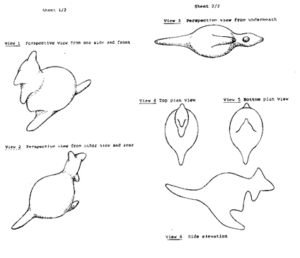 Because of their size, colour and position, the “Jumpys” and “Funny Frisch” marks draw more attention than the kangaroo shape (para. 39). The depictions of the shape thus do not serve the function of origin from the public’s perspective. The judgement is certainly worth discussing, both regarding the assessment of the individual facts, and regarding more general assumptions of how the public perceives shape marks in relation to other marks. The Court may have jumped to conclusions here. According to established jurisprudence, the trademark owner does not have to show that it has used the mark on its own, independently of other marks (Judgement of 8 December 2015, T-29/04 – Castellblanch/HABM, para. 33, 34; Judgement of 21 September 2010, T‑546/08 – Villa Almè/HABM – Marqués de Murrieta, para. 20). EUIPO and the Court have acknowledged in the past that the joint affixing of separate marks or indications on the same product is a common commercial practice, e.g. in the wine and automobile industry (Judgement of 8 December 2015, T-29/04 – Castellblanch/HABM, para. 33, 34). In general, it is correct that the registration of a shape does not mean that any use of it is seen as an indication of origin. The specific design of the “Jumpys” packaging, however, does not particularly suggest that the kangaroo shapes are perceived as secondary or ancillary. They are clearly visible and cover as much space of the surface as the marks “Jumpys” and “Funny Frisch”. It could be a tenuous assumption that the public does not see a shape as an indication of origin if it is accompanied by word or device marks. In the case “Goldbären”, para. 37 , the German Federal Supreme Court denied any rule of experience that a complex mark consisting of shape, colour, words and devices is dominated by the word element. Finally, it is a questionable premise that the consumer must see a shape mark at the time of purchase in order for the shape mark to function as an indication of origin. In the Storck case of 2006, which deals with a shape mark for a toffee, the ECJ held that the post-sale situation of unpackaging the toffee can be relevant for enhanced distinctiveness. There is no apparent reason why that situation should be irrelevant per se when it comes to genuine use. This fundamental question of genuine use post-sale opens the door to proceedings before the ECJ. Many owners of shape marks would observe such proceedings closely.